There is such a pastry right now, called Kouing Amman (pronounced “queen”), that is getting a lot of attention. And rightfully so! This particular pastry is made from a laminated dough using salted butter and lots of granulated sugar, which gives it a salty-sweet flavor, very similar to salted caramel. Now I am big caramel fan, as well as a big laminated dough fan. Call me a nerd, I know I am. As a pastry chef, I fully appreciate flavors that are not all sugary-sweet, and caramel is one that allows contrast- so important in balancing any dessert. Laminated dough is a style of pastry arts in which butter is incorporated into the dough during a series of folds. The dough is rolled out, folded, and turned numerous times to create layers of dough and layers of butter. When the pastry is baking, the butter creates steam, which in turn creates the little pockets of air that make the pastry flaky and light. It sounds a bit complicated, but laminated doughs are easy once you get the hang of them. I found this recipe from Joe Pastry’s blog, and it came out great. The dough is smooth and effortless to roll out. I made the entire pastry start to finish in a matter of hours, without a dough sheeter, in our hot and bustling restaurant kitchen. Unlike some laminated doughs, this recipe doesn’t require long periods of resting the dough in between each fold. 15-20 minutes works fine. This is a recipe that can be used interchangeably for sea-level or altitude. At higher elevations the dough will rise a bit faster, and you may need to add more water if you have very dry flour. Make sure you use a high quality salted butter (or sprinkle some fleur de sel over your unsalted butter), and be generous with the sugar! *This recipe makes a large batch. Feel free to cut it in half, especially if you are using a standard size electric mixer. Combine the flour, melted butter, water, and yeast in the bowl of an electric mixer, using the dough hook. Mix for a few minutes until a dough comes together. It may be a little rough looking, that’s okay. It will smooth out once you incorporate the butter block. Transfer dough to a greased bowl and rest at room temperature for half an hour, or until doubled. While the dough is resting, make a butter block. To do this I like to cut my pound of butter in half and line the pieces up, side by side, on top of a piece of plastic wrap. Enclose the plastic wrap around the butter to form a “roomy’ 9″ x 9″ square. This will give the butter space to fill as you roll it out. Using a rolling pin, pound the butter to soften it and roll it into the corners and spaces of the square, into an even layer. Put it back in the refrigerator until ready. Flour your work surface and roll out the kouing amman dough until it is roughly 3x the length of your butter block. It should be just a tad wider than your butter block. Place the butter block in the center and fold the top half, then the bottom half, over the butter block to enclose it. Turn the block 90 degrees and roll out again. Fold the same way. You have completed your first ‘turn’. Wrap the dough and let it rest for 20 minutes in the refrigerator. This gives the gluten time to relax and makes the dough easier to handle. Repeat the rolling, folding, and resting 2 more times. On the final rolling, sprinkle the 1 cup of sugar over the dough before folding it up. Let it rest again. Just to be clear, once the butter block is incorporated into the dough, you will roll it and fold it a total of three times. Then you will roll it out a fourth time to cut it and bake it. Almost there! I rolled my dough to about 1/4 ” thickness and cut it into small squares. I shaped the dough into little pockets and placed them inside of 3-inch tart rings. You can also roll the dough a little thicker and place circles of it inside of parchment-lined cake pans. Brush the dough with egg wash and let rise until doubled, about 40 minutes at altitude, or about an hour and half at sea-level. Brush again with the egg wash, then sprinkle with some more sugar. Bake at 350 degrees until the dough is golden brown and the sugar has caramelized, about 15-20 minutes, depending on the size of your shapes. Let cool slightly, then remove from the molds or pan. These are best the day they are baked. 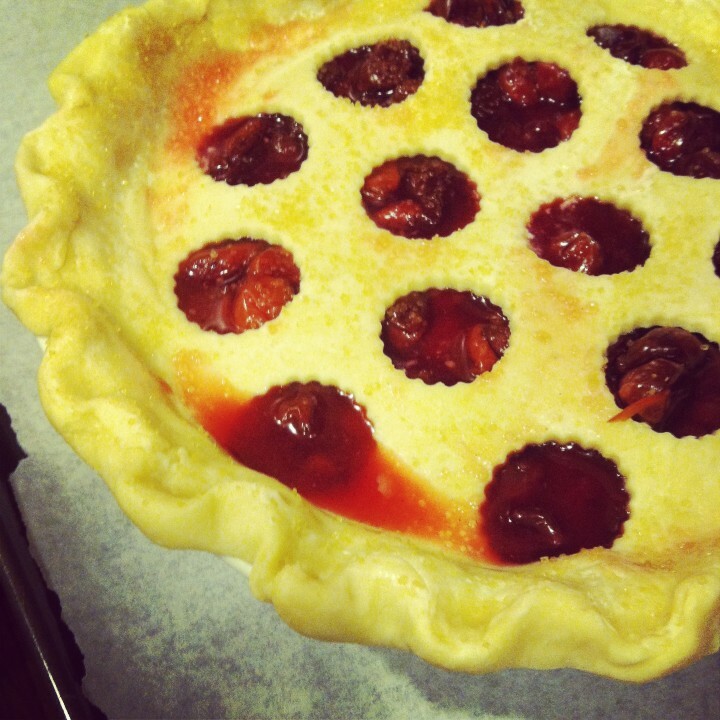 This recipe gave me two 10-inch rounds, plus ten 3-inch pastries.